Released: June 2008. Genre: Survival-Horror. Other versions: X360; PC; Wii. From start to finish, Alone in the Dark’s rebirth feels like one long headache dressed as a video game. It’s a disappointing effort from Hydravision, whose ObsCure games represented a diminishing traditional survival-horror presence during the early years of the new millennium. Sadly, the one-time progenitor of horror-adventures continues to flounder however, as another attempted reboot ultimately goes awry in the wake of some promising ideas. Seven years after useless weaponry, a dubious save system and an absurd amount of enemy respawning scuppered The New Nightmare, the most recent imagining of Alone in the Dark fails on largely different grounds. Glaring technical troubles, bum use of sound and lamentably poor ‘logic’ puzzles make for a staccato, unsatisfying experience that is less than the sum of its parts. It’s a shame because it offers the kind of adventurous ideas we’ve come to expect from the developer. Interchangeable first and third-person perspectives are a rarity among PS2 games, and commendably, AITD manages to pull both of them off effectively, capturing a sense of claustrophobia and vulnerability. The healing system sees central character and convenient amnesiac Edward Carnby disinfecting and bandaging his wounds, which is certainly different (though does becomes a bit of a chore). In a novel attempt at a less formulaic inventory system, Ed lines his many pockets with items, which proves a neat, if ever-so-slightly fiddly, means of utility. Holding R3 sees the lead protagonist close his eyes, revealing weak points on foes or points of interest within the immediate surrounds. Though the idea is put to largely uninspired use, it’s another credible innovation. Navigation is acceptable enough, if you can overlook some dodgy collision parameters. Melee combat is pleasingly solid, as Edward can fling everything from bins to fire extinguishers, landing blows with a satisfying thunk, whilst such items can also be used on occasion to knock through doors. Firearms are a little hit and miss; they do the job, but you wouldn't invest a great deal of a faith in a bullet connecting. The chief problem lies in the disappointing, scattergun logic puzzles. There’s precious little guidance on how to interpret environments area by area, meaning sections become protracted and tedious as you try to work out what it has in mind for you next. A rope-swinging section early on is so dodgy, you essentially have to guess where you think the game wants you to head next. A scene in a multi-storey car park involves all manner of car-hopping, fire-extinguishing and shutter-shooting that seems entirely unfathomable without additional insight, which sadly the game is reluctant to offer. Perseverance may ultimately lead to progress, but it’s unlikely to stand you in good stead, as you’ll keep getting stuck at regular intervals. One particular low point sees the player having to use a forklift to move some wooden pallets around so as to create a gap to fit between them. This dismally clunky situation is rendered worse by collision physics that randomly deny the player passage even after a gap has successfully been engineered and the forklift driven into the open space. By the time you reach an inoperable train with the single-leaver that doesn’t do much of anything regardless of the variations you try (again, no hints whatsoever), you’ll wonder if it has all been worth the hassle. The feeling of accomplishment garnered from conquering the satisfying puzzles that permeate Silent Hill and Resident Evil is entirely absent here. There are other baffling misjudgements. Perhaps most noticeable is Edward’s mobile phone. Initially an attractive proposition, it soon becomes apparent that, for all its features, the phone appears to have been the victim of an abortive bit of design. Messages and notes are dull and infrequent. As for phone calls? I made them frequently throughout my treks in AITD, yet you’re constantly greeted by a message claiming the lines are out. The sum total of my endeavours was one answer from one recipient, which about says it all really. "...is it my imagination, or did I leave the oven on?" It pulls up short of Silent Hill 2’s visual splendour and atmospheric resonance, but Alone in the Dark looks good. The locales jump from sprawling parks and office blocks, to museums and the now-token sewer, whilst the dingy, heavily-shadowed environments create tension and look attractive under the torch effect. Edward is well-animated both in-game and during cinematics, and hobbles with some degree of conviction whilst injured. The range of secondary characters generally fit the bill, although Carnby’s partner Sarah looks like a curious mix of FFVIII’s Selphie and Joan Rivers. Brief instances highlight AITD’s potential as the game’s neat touches come together, such as a sequence later mirrored in Uncharted 2 which sees Edward desperately scrabbling up a cliff through the tenuous, fall-at-any-moment wreckage he’s using for climbing apparatus threatens to fall away. Better still is a section that sees Ed tip-toeing his way around a museum’s alarm-system, highlighting the laser wires by spraying them with a fire extinguisher. But you get the impression that, beyond a flurry of concepts and ideas, it never really gels. This notion extends to the sound which offers a fairly neat allegory for the game as a whole; at times the haunting compositions are genuinely impressive, but more often than not it fails to hit its cues, meaning the gravitas of the music is entirely lost as it plays along incidentally in the background. Carnby’s a touch too sullen, but you can’t blame him, as when you’re escorting Sarah at points, it seems that whenever she thinks of something stupid and irrelevant to say, she regrettably can’t keep it to herself. Despite what all the chin-scratching sessions will have you believe, it’s short. Even so, I’d wager most won’t bother seeing AITD through to the credits even once. 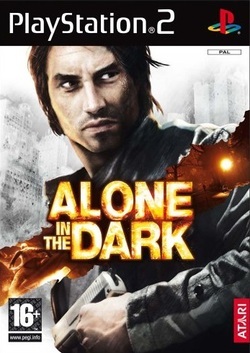 A tiresome, disheartening mishmash of promising ideas, inconsistent programming and ultimately unsatisfying stop-start gameplay, Alone in the Dark is a below-average adventure that should have acted as a triumphant rebirth for the venerable series. Instead, it has pretty much consigned it to the grave.